I already have a couple of portable chargers but both are quite heavy and one is bigger than I would like. 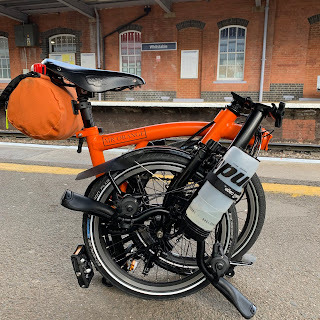 When I was at Costco recently I saw a double pack of small and lightweight chargers that seemed to fit the bill for Brompton adventures. At the moment you can get these for £17.99. They are made by 'Cygnett' and 4400mAh power. This means that I can charge my iPhone 6 Plus at least two times or my Garmin 810 several times over. They are not the most powerful of portable chargers but enough to keep my phone and / or Garmin charged on longer rides, night rides - where I have had to use my phone all day and not been able to charge it before heading off. Another nifty feature of this charger is the small LED light that you can switch on if needed. Again rather hand for night rides. In addition this this they come fully charged. The charger feels as if it has a slightly rubberised texture and this makes it quite grippy - a very good thing. It also comes with a small micro USB cable which you can use to charge it via a PC USB port or wall charger. The instructions say that charging from empty to full takes 7 hours but I have in about 3 and a half hours. The battery in my iPhone 6 Plus is so good I doubt if i would need anything too powerful as it seems to last forever. As I have written, there have been occasions where I have used my phone throughout the day at work, head home and then get ready for a night ride to the coast without being able to charge it further. Having this small and lightweight charger will be very useful. My current ones are too heavy and bulky and I rarely take them with me as a result. The other charger I have given to Mrs Orange and my older more powerful ones to the Orangettes. I am not sure what the cost of these is in others shops but I consider it a pretty good deal. With some night rides in the pipeline I can see these coming in very hand and will certainly find a place in my saddlebag. ONE MILLION Page Views...Thank you! Two punctures on commute home! London to Gravesend or should I say Otford!